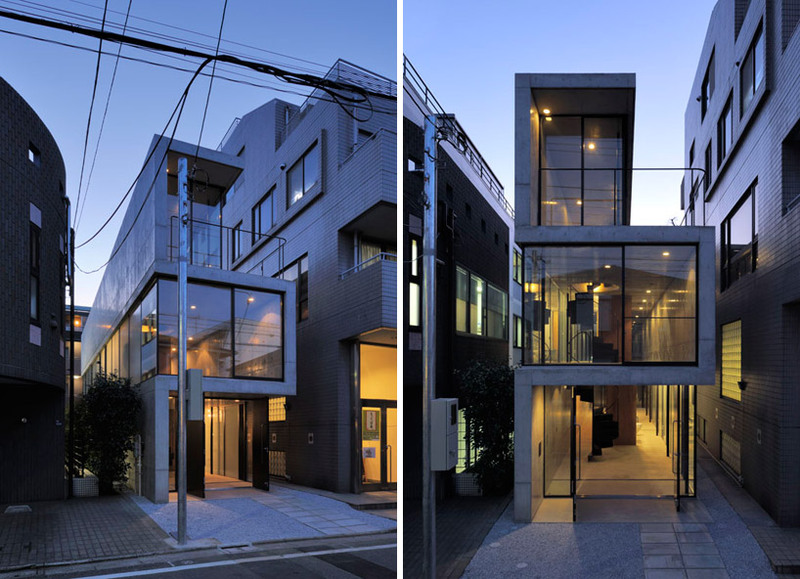 florian busch architects is an office practicing architecture and urbanism based in tokyo, japan. tokyo-based firm florian busch architects has recently completed ‘house in takadanobaba’, a narrow dwelling positioned upon a remnant plot in tokyo, japan. emerging as a by-product of constant practice of subdivisioning larger sites, the 4.7 meter wide by 22 meter long strip of land is left between two existing building masses. stretching the entire length of the home, a concrete structural element rises and folds at 90 degree angles to form the wall, floor and roof planes, alternating the direction of views from each level. when observed from the street, the exterior elevation is defined by the cross section, exposing its rigid and light composition enclosed with glass on the open sides, inhabitants enjoy a feeling of spaciousness even with its limited usable area by visually incorporating and utilizing the gaps surrounding the structure. neighbor to neighbor relationships are generated as well as creating a location to observe the changing seasons within the urban context. internal rooms are separated with delicate fabric curtains instead of permanent partitions, accentuating the elongated proportions of each storey. team: FBA: florian busch, sachiko miyazaki, momoyo yamawaki structural engineering: oak (masato araya, tomonori kawata) mechanical engineering: ymo (hiroyuki yamada, natsumi tsuchiya) textile design: yoko ando photography: hiroyasu sakaguchi (AtoZ) contractor: yabusaki corp.
pretty much flawless except for that grey curtain – ugh. Seemingly narrow structure but when you peer into the space it really opens up and loses any sense of confinement. The levels are really interesting and all seem to open up beautifully with large expanses of glass. As for materials the polished concrete is an excellent minimal solution that brings both interior and exterior into a credible living space concept. Absolutely beautiful idea and intelligent executuion. Just cracking one off to that spiral staircase. I agree. The house is perfect, I just don,t care for circular stairways. Would love to build it. i like it overall. i also like the staircase. But what worries me most is that you would get on the balcony and you can just stare into the neighbors’ windows. remembering old times’ rem koolhaas!